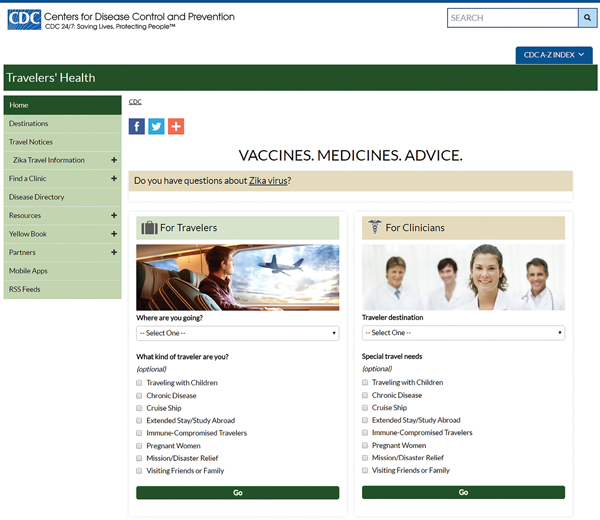 The CDC Travelers’ Health website (www.cdc.gov/travel) offers destination-specific vaccine and travel health recommendations, travel notices, help with finding a travel medicine provider, and other resources for travelers and clinicians. The home page (Figure 1-01) includes separate portals for travelers and clinicians. Users can also select special populations (such as “traveling with children” or “immune-compromised travelers”) to receive customized health recommendations. Resources for clinicians (wwwnc.cdc.gov/travel/page/clinician-information-center) includes clinical updates on travel medicine–related topics and continuing education courses on travel medicine. Resources for travelers (wwwnc.cdc.gov/travel/page/resources-for-travelers) provides printable fact sheets that cover over 40 travel health topics written in plain language for the international traveler. Topics include travel health insurance, jet lag, motion sickness, cruise ship travel, and travel to high altitudes. Resources for the travel industry (wwwnc.cdc.gov/travel/page/travel-industry-information-center) contains guidelines for the air travel and cruise ship industries. It includes information on reporting illnesses and deaths among travelers, managing ill crew members, and other guidance. The disease directory (wwwnc.cdc.gov/travel/diseases) is a list of diseases that may be related to travel. It provides a resource on rare as well as common infections, the risk to travelers, and what travelers can do to prevent them. CDC posts travel health notices about disease outbreaks and international events (such as natural disasters or mass gatherings) that may affect the health of travelers. The notices include information about what the situation or health risk is, who is affected, how travelers can protect their health, and links for more information. Travel health notices and information about travel notice categories can be found at wwwnc.cdc.gov/travel/notices. CDC has developed a mobile application for travelers, TravWell, in addition to the mobile version of the Yellow Book. It is available for iOS and Android devices and can be accessed from wwwnc.cdc.gov/travel/page/apps-about. CDC’s TravWell is a companion application to the Travelers’ Health destination pages. It allows users to build an itinerary and receive destination-specific vaccine and medicine recommendations. For each itinerary, it also generates a customizable, destination-specific to-do list and packing list. TravWell also prompts users to set reminders for healthy behaviors, such as taking malaria prophylaxis or getting booster doses of vaccines. It also provides users with a place to store electronic copies of health-related travel documents, such as prescriptions or vaccination records.